How far will you go to be famous? This is the key theme that is explored in Ruthless!, a musical that does not hold back in poking fun of the brutality involved in succeeding in show business and all the stereotypes that come with musical theatre. The show achieves its aims somewhat, satirizing the very world it belongs too, however, ideas run thin as the musical progresses, with the farcical humour repeating itself and becoming less clever. We start the show with suburban mum Judy (Kim Maresca), being visited by the flamboyant yet classy Sylvia (played in drag by Jason Gardiner). Maresca pitches her Stepford-Wife character perfectly, as she moves around the stage almost robotically. Her opening number “Tina’s mother”, an early indication of her role in life, is actually one of the highlights of the show. Gardiner also does a fine job as the intruder, Sylvia, who arrives unannounced to make young Tina a star. In the most part, Gardiner avoids the temptation of receiving cheap laughs by almost underplaying his character, and this plays dividends, making Sylvia a more well-rounded and intriguing character. The production is at its best when it is just Maresca and Gardiner. In these moments, the dialogue moves at a steady pace and there are endless one-liners and word plays to enjoy. Both actors are quick witted and deliver the humour perfectly. Unfortunately, the show diverges from this simple setting, throwing plot twists and extra characters into the mix and losing a lot of the subtlety of the script. Richard Fitch’s direction is a lot more successful in the first half than the second. He creates a small town feeling and handles a number of dramatically written characters well. The contradiction of the enviroment and people within it works well and everything moves at a steady pace. In the second half, as the plot gets a little more bizarre, everything begins to look a lot more cluttered and originality is lacking from the rather forgettable musical numbers. Anya Evans, who shares her role with 3 other actors during the run, does a brilliant job as the bratty Tina. She plays the part with a psychotic hunger to succeed and her sickly sweet mannerisms are so on piece that they are almost too much to watch at times. While many of her songs demand an OTT performance (which she gladly delivers), there is still enough room for her to show off her mature and accomplished singing voice. Evans easily holds her own alongside her adult co-stars and has a clear understanding of the comedy within the piece, providing numerous laughs through the production. A special mention needs to go to Morgan Large, who produces both a bright and beautiful set along with the costumes to go with it. The visual looks like something straight out of a 60s movie set and appropriately places the piece in suburbia. 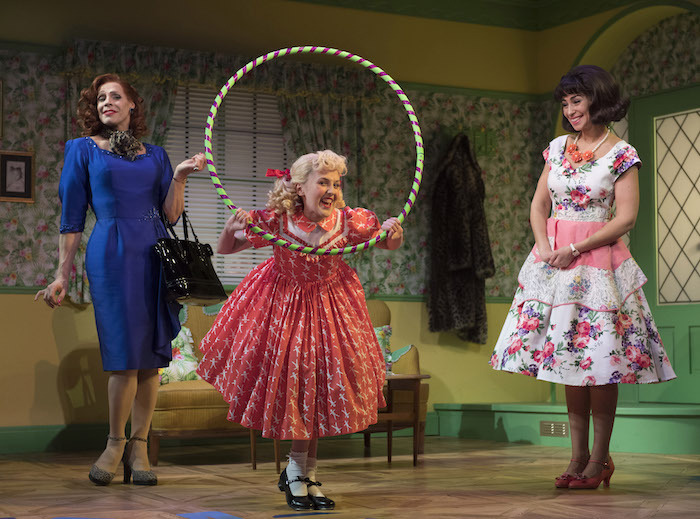 Ultimately, despite the efforts of its three leading actors, the musical loses its way, and while there are definite moments of laugh-out-loud humour, ideas repeat themselves too much, leaving a fairly unengaging second half.